Fool Me Once: Should Alleged Cheaters Be Allowed To Play? Every once in a while, something will come up that fires me up a little. Last week, the World Series of Poker announced that it would not allow members of the media to play in bracelet events. After backlash from the Twitterverse, the WSOP changed its mind and all was right in the world again. Fire cooled. Last weekend, the World Poker Tour kicked off its final event of Season IX — the World Championship at the Bellagio. I try to stay as off the radar as possible on the weekends, but after skimming Twitter on Sunday, I saw that Ali Tekintamgac was playing in the $25,000 WPT World Championship. Here we go. Who is Ali Tekintamgac? 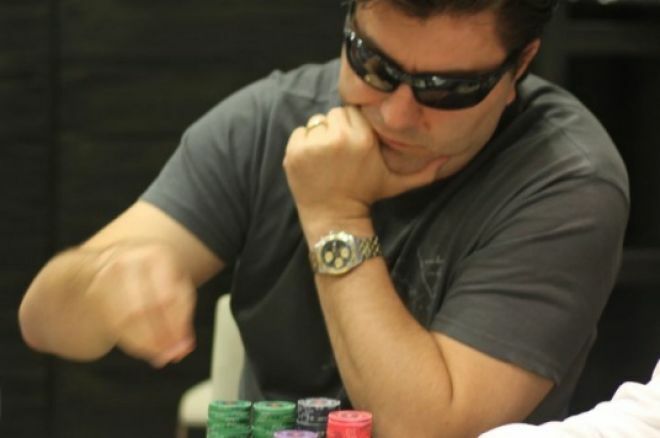 He is the same man who final-tabled the Partouche Poker Tour last year and was disqualified for alleged cheating by using a member of the media to relay other players’ hole cards. How is a player who was disqualified for cheating allowed to register for another tournament with no consequences? Easy. There is no governing body to impose any sort of ban or suspension for players caught disgracing our great game. Before you start flooding the comments section below this article with "other cheaters have been allowed to play before" and "he's not the first to cheat," and "careful with wording," let me say that I am aware that he's not the first to cheat, and I didn't forget the Men Nguyen controversy or even the Sorel Mizzi drama that took place just a few months ago. The Men Nguyen incident is, no doubt, deplorable. And as for the Mizzi drama bomb, while I think Sorel is a nice guy, I wouldn't play heads-up Chinese with him, with his money. It's not because I believe John Racener over Mizzi, but why would I put myself in such a situation if there were even the slightest chance? It's a preventative measure - like sunscreen or a seatbelt. And for those of you calling out Justin Bonomo and JJProdigy for their online transgressions, remember, they were publicly vilified and reprimanded by the online rooms they had duped. Reprimanded being the key word here. In 2007, New England Patriots coach Bill Belichick was fined $500,000 for spying on an opposing team's defensive signals, and the team itself was fined $250,000. A Patriots fan might think that's excessive. I don't. So that people don't say I'm biased, my beloved Tennessee Vols were recently in the middle of a cheating scandal. Basketball coach Bruce Pearl didn't follow recruiting rules, so he is now out of a job with the Vols. In another example, UFC fighter Chael Sonnen was suspended for six months by the athletic commission for testing positive for elevated levels of testosterone. These are just three cases in which people were punished for breaking the rules, and there are countless more across nearly every kind of sport. Punishment for cheating doesn't stop with sports. Insider trading? Ask Martha Stewart how that goes. Cheat on your taxes? Enjoy those fines and possible jail time. In every instance, individuals who cheat and get caught are punished. Period. One big reason that people are punished for breaking rules? Governing bodies that protect the integrity of the organizations and their members. Poker doesn't have a governing body, but this doesn't mean the game can't be governed. Where tournaments and tournament directors fail, the players themselves should take a stand. Do you think every person in the 220-player field at the World Poker Tour World Championship knows who Tekintamgac is? The players who are on the forums and poker media sites every day know, but what about Joe Smith from Middle of Nowhere, USA who has $25,000 and a dream because he watched the WPT one Sunday night? How would he know that the person on his left was disqualified from an event because a tournament director had enough evidence to confirm cheating? For those of you who are saying that Scott Seiver and Daniel Negreanu shouldn't have called Tekintamgac out during Day 1 of the tournament - I think you're wrong. They were justified. I wouldn't want to be sitting at a table with a known or alleged cheater, and I'm sure that table, or even the room didn't either. If players can't protect players, who can? Twenty-five thousand dollars isn't peanuts; it's serious money that people are putting up in hopes that they can turn their investment into a million. All NFL teams were alerted when Belichick was caught. Do you think the teams Belichick plays aren't on the lookout now? The entire middleweight lineup of the UFC knows Sonnen was suspended. If you're going to let Tekintamgac play, then at the very least, full disclosure should be mandatory. Tekintamgac knows about the drama surrounding him. A lawsuit is going on. Why did he choose to show up? Did he think people wouldn't make a fuss about it or did he want to show just how invincible he is? In the wake of the online poker indictments, there are a handful of players who are MIA at the moment. They probably didn't want to miss this event, but it was in their best interests not to play. Why couldn't Tekintamgac see that maybe he should have waited for this whole thing to blow over? So what's a good solution? Should alleged cheaters be allowed to register in tournaments without having faced some sort of punishment? Maybe there should be a unified ban imposed individually by the tournament directors and tournament staff on players who are found to be cheating. It doesn't have to be a perma-ban, but some action should definitely be taken. According to some people, Tekintamgac was never caught red-handed. So did he cheat? The tournament director had enough evidence to disqualify him from the final table of the PPT - an event where Tekintamgac stood to win €1.3 million. Do you think he would have done that if he didn't have solid evidence? I, for one, don’t think so. Also, it was reported that prior to the PPT scandal, Tekintamgac was suspected of cheating at EPT Tallinn. In this delicate time in poker's history, the game doesn't need any more black eyes than it's gotten in the past month. Allowing cheaters to play in one of the most prestigious events in poker is just another haymaker thrown to the face of our great game…but not from the hand of Chael Sonnen, he's still suspended - for cheating. *Editor's Note: Thomas Kremser was removed from the article as it has been found he was not the tournament director at the Partouche Poker Tour as previously stated. Have a comment? Leave it below. And while you're at it, follow us on Twitter and like us on Facebook.